The Psalmist tells us in Psalm 139:16, that “all the days ordained for me were written in your book before one of them came to be.” Theologians often make much-to-do about the Characteristics of God. 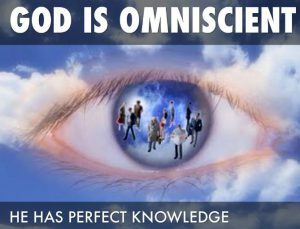 One of those characteristics that is often discussed is His “omniscience.” “Omni” means all, and “science” means knowledge. God is “all knowing.” I like to think of it in my own language as God simply knows everything. He knows how many stars there are. He made them. He knows the depth of space, He made it. He knows about math and physics and chemistry and every other discipline because He was the one who established them. Again, simply put, God knows everything. But the Psalmist isn’t talking about that kind of knowledge necessarily. The most personal aspect of God’s omniscience is that He knows all about me. God knows all about my past. I have no skeletons in my closet with God. I’ve not done anything in private. I can say “God, let me tell you about something.” And then when I’m done, God says, “I know.” We cannot surprise God with any confession. He already knows it all. He knows what I’m thinking and what I’m feeling and understands the inner most struggles in my life. There is nothing about me at this moment that God is not fully aware of. He even knows when a strand of hair falls from my head. He has them all counted. That’s how close of attention He pays to us. He also knows every decision we will make in the future. He knows all of our successes and more importantly He knows all of our sins and failures. There is nothing about us that God doesn’t know. He knows it all before it even happens.